Avendus Capital advises 3i Infotech on the sale of its UK based Investment Management Solutions business to Objectway SpA. 3i Infotech Ltd., has completed a transaction for the sale of its UK based Investment Solutions business (3i Infotech Western Europe Ltd., the “Company”) to ObjectWay Financial Software S.p.A, a leading Italian company providing investment management software to wealth & investment managers. 3i Infotech Western Europe Ltd. is a leading provider of investment management software solutions to mid-market UK firms. It provides front-to-back office solutions focused on private client investment managers, private banks and full service execution stockbrokers. The existing management team will continue to manage its day-to-day operations post the transaction. Avendus Capital was the exclusive financial and strategic advisor to 3i Infotech for this transaction. Incorporated in 1993, 3i Infotech is a public global Information Technology company committed to Empowering Business Transformation. A comprehensive set of IP based software solutions (20+), coupled with a wide range of IT services, uniquely positions the company to address the dynamic requirements of a variety of industry verticals, predominantly Banking, Insurance, Capital Markets, Asset & Wealth Management (BFSI). Furthermore it offers solutions to the government, manufacturing, retail, distribution, telecom and healthcare sectors. Among its repertoire of IPR based solutions the flagship products of the Company are Premia, MFund, Orion, Kasle ULS and Amlock. The Company is also focused on value added services such as business intelligence & analytics services, infrastructure management services, testing & compliance, application development & maintenance, consulting and its BPO offerings. The Company, headquartered in Mumbai, India has over 9,000 employees in more than 27 offices across 12 countries and over 1500 customers in more than 50 countries across 5 continents. 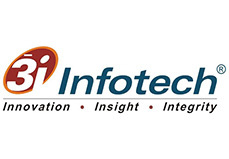 About 3i Infotech Western Europe Ltd.
Based in the UK, 3i Infotech Western Europe Ltd. Provides investment management software solutions to mid market firms in the UK. It has had its products established in the UK market for over 25 years and services over 30 clients. With a strong management team, it has ~ 170 employees primarily based out of the UK. ObjectWay Group was founded in 1990 and has grown to be a leader in software applications and technology services for financial markets and other corporates in Italy and Europe. The group consists of two companies: Objectway Financial Software SpA - the parent company - and Objectway iTec SpA. The Financial Software division develops software platforms based on a shared, open application architecture and database. The software answers to the needs of the financial services industry: banks, asset management companies, brokerage houses, insurance companies and consumer credit in the areas of financial and insurance product sales, advisory services, fee & revenue management, sales network management, securities processing and asset management. Avendus Capital is a leading financial services firm which provides customised solutions in the areas of financial advisory, equity capital markets, alternative asset management and wealth management. The firm relies on its extensive track record, in-depth domain understanding and knowledge of the economic and regulatory environment, to offer research based solutions to its clients that include institutional investors, corporations and high net worth individuals/families. In recent years, Avendus Capital has consistently been ranked among the leading corporate finance advisors in India and has emerged as the advisor of choice for cross-border M&A deals, having closed around 40 cross-border transactions in the past 5 years. Avendus PE Investment Advisors manages funds raised from its investors by investing in public markets, while Avendus Wealth Management caters to investment advisory and portfolio management needs of Family offices and Ultra High Networth Individuals / families, spanning all asset classes. Headquartered in Mumbai, the firm has offices in New Delhi and Bangalore. Avendus Capital, Inc (US) and Avendus Capital (UK) Pvt. Ltd. located in New York and London respectively are wholly owned subsidiaries offering M&A and Private Equity syndication services to clients in the respective regions. Avendus Capital, Inc (US) also provides wealth management services to clients in select jurisdictions in USA.